Can brick&mobile assist me in customizing my sales and marketing materials? Yes, simply contact us and we can help you get your mobile marketing materials customized to your business. How do I get access to your Members Area? When you become a reseller of brick&mobile we provide you instant access to our Members Area where you will find our sales and marketing materials. What will I find in the brick&mobile Members Area? The brick&mobile members area is a secure portal that contains valuable resources that help our resellers build their own mobile marketing businesses. Do I need to be technical to sell mobile marketing products? No! All of our products have been built from the ground up to give a user-friendly experience that anyone can use. Offer in-depth sales and support webinars, along with dedicated support staff, we give you everything you need to build and maintain a successful profitable mobile marketing business. We also offer design and management services to allow you to focus on selling. Will my clients know that I am using these tools? No. Our mobile marketing products are white labeled so your customers never know we exist in the background. Everything from generic redirect scripts to white labeled DNS and custom URL’s we give you all the tools you need to get your own Mobile Marketing business off the ground. brick&mobile gives you the tools you need to secure big profits using each of our mobile marketing solutions. With our Pay-As-You-Grow business model we give you best in class mobile platforms to get your mobile marketing business off the ground at a minimal investment. What is brick&mobiles Business in a Box? Our Business in a Box program is a bundle of all our services Mobile CMS, SMS and our QR Code Manager. When you package our products together you qualify for special Business in a Box pricing. We provide you with a turn key solution to get your mobile business off the ground in days not months. Do you offer a White Label option for resellers? Yes we have a Premium White Label Reseller program that allows you to white label our entire platform. Our Premium White Label Reseller program allows you to sell direct to customers and to other resellers. We give you all the tools to start your own Premium Mobile Website reseller program. Contact us for more information regarding this exciting program. Can I host my own mobile sites that I create with your Mobile CMS? No. Our system is setup to be a turn key platform, meaning we provide the hosting, platform updates and service to ensure your mobile sites are available 24.7 365 days a year. If you were to host the sites on your own server then we would not be able to apply critical updates and enhancements to our system. Can I use my own custom URL for my mobile website? How much can I sell a premium mobile website to my customers for? Typically our resellers charge their customers anywhere from $500-$2000 to design and setup a mobile website. There are a number of ways in which you can bundle our mobile marketing value add services such as QR and SMS to up sell your customers and prospects. Charge an up-front setup cost for the design and set up of the mobile site. Charge a monthly fee to your clients. Combine options by charging both an upfront fee and a monthly fee for the ongoing management of the mobile site. brick&mobile allows you to charge your clients and prospect whatever you choose, you have the flexibility to package and price the product as you see fit for your business. Can you help my business with sales and marketing materials? Yes! Our resellers get FREE access to our exclusive members area where you can download a huge selection of professional templates of Business Cards, Brochures, Presentations, Sign-Up contracts and much more! We also offer exclusive training and webinars to our resellers to help you sell and close deals. I’m not technical, can I still be a reseller? Yes! Our mobile content management system allows you to create stunning premium mobile websites in a few hours with no technical knowledge needed. Our Mobile CMS tools are developed to allow you to easily create websites for your customers with our user friendly Mobile CMS platform. 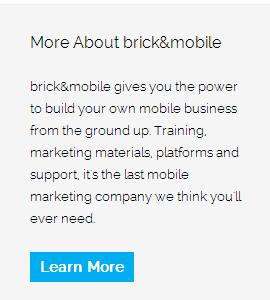 Will my customers know brick&mobile exists? No. Our Mobile CMS platform is white labeled so your customers never know we exist in the background. Everything from generic redirect scripts to white labeled DNS and custom URLs we give you all the tools you need to get your own Mobile Marketing business off the ground. Why build a mobile website and not an app? Premium mobile websites are much more effective, are cheaper to manage, have a wider reach, and seamlessly work on any phone without downloading! Apps for local businesses offer no SEO benefits, require app store approval, are hard to update and only work on certain phones. Our fully-hosted, Mobile Content Management System (MCMS) allows you to build and re-sell premium mobile websites to your customers. How can I see a demo of your QR Code Manager? Simply go to our signup page and signup for a demo of our QR Code Manager. The demo is limited to 1 campaign but you will easily see the power of this platform once you give it a test run. What file formats does your QR Code Manager support? ur QR Codes can be exported to all the latest web and print formats including; jpg, gif, png, pdf, eps. The QR codes created and exported from our system can be used in vector format (eps) for large print advertisements giving you a lot of flexibility of what you can offer your clients. Will my customers know I am using the brick&mobile QR Code Manager? No. We have private labeled the platform, which means your customers never know we exist in the background. How can I make money selling QR Codes? We look at QR Code marketing as a piece of the mobile marketing puzzle. Combining QR Code marketing with premium mobile websites and SMS marketing you can deliver a complete mobile marketing campaign that agencies charge tens of thousands of dollars to create. You can bundle QR code marketing with our other products or run it as a standalone offering, allowing you to offer your customers cutting edge mobile marketing campaigns. What is the brick&mobile QR Code Manager? Our QR Code manager is a powerful mobile marketing tool that allow you to provide your clients with valuable reports showing exactly how effective their QR code campaign is running, where their QR codes are being scanned on a map with GPS accuracy, or even how many times the same person scanned a specific QR code with social media analytics. You can now offer advanced QR codes campaigns to clients using the most robust QR code analytics platform available. Does your SMS Platform use long codes? No. Currently our SMS platform only works with short codes. Can your SMS Platform be white labeled? Which countries does your SMS Platform work in? Currently our SMS platform works in North America on most of the major carriers networks. Click here for a full list of supported carriers for our SMS platform. What is brick&mobile’s SMS Platform? Our SMS platform doesn’t just simply sending out a few text messages and calling it a day. Leverage our suite of easy to use professional SMS marketing modules to help you launch your own SMS marketing campaigns for your clients. Do you offer White Label SMS (text message marketing) solutions? Yes! Our White Label SMS platform is a separate product which can be added to your package. Currently we have White Label SMS available in USA, Canada and UK. How many demos can I have live? Unlimited! You can have unlimited amounts of demo sites that you can use to pitch potential clients. You only pay for the sites that you actually sell, a TRUE pay as you grow model! Can I duplicate sites to make quick demos for my clients? Yes! With our “Push Button” mobile site duplication tool you can easily create and duplicate templates in the matter of seconds. Create your own library of templates that you can use to easily deploy “pre-made” mobile sites for your clients or resellers. Can I have my White Label Mobile CMS translated? Yes! We have the capability to translate our platform into any language you like. Right to left is not a problem either. Each mobile site created on your White Label Mobile CMS has built in regional settings allowing you to sell anywhere in the world! Does the White Label Mobile CMS include themes and icons? Yes! We pre-load your White Label Mobile CMS with 100 pre designed themes that you or your clients can use to easily build mobile sites with. Yes! Our rock solid cloud infrastructure ensures your platform and sites are always secure and available. Each White Label Mobile CMS is secured with 256 bit SSL encryption to ensure maximum security of your White Label Mobile CMS. Can I make custom enhancements to my White Label Mobile CMS? Yes! Our technical team can make custom features and enhancements for your White Label Mobile CMS. Each project is quoted based on the scope and the estimated time it will take us to complete your project. Do I have to pay for new updates to the platform? No. Our platform is constantly updated on a month to month basis. Our technical team is always working on new features and enhancements which are automatically pushed down to your White Label Mobile CMS at no extra charge. How many sites can I have on my White Label Mobile CMS platform? Unlimited. You can create as many sites as you like with your own platform, as we create you your own dedicated mobile server which allows you to scale your business as large as you want. Yes! You have complete user access control with your own White Label Mobile CMS. You can control/limit the amount of sites a client can create. You can also restrict and segment which sites your clients have access to. What is the difference between a White Label Mobile CMS and a regular Mobile CMS reseller account? White Label Mobile CMS:Our White Label Mobile CMS is a mobile website builder rebranded for your business. Your company’s corporate identity is replicated to ensure the continuity of your corporate brand.With a White Label Mobile CMS you have complete administrative control of the platform. Easily limit and restrict access to specific mobile sites or even set the limit of how many sites your client can create.Our White Label Mobile CMS is a true white label solution meaning your clients or their webmaster can never know brick&mobile is powering your platform in the background.Mobile CMS Reseller Account:When you sign up for a regular Mobile CMS plan such as our Starter, Growth or Pro plans you only get 1 user account.When you log in to create mobile sites you use the brick&mobile builder so your clients cannot log in and make their own changes. The mobile sites you create with a Mobile CMS Reseller account are completely white labelled and can be resold to your clients.